Is Netflix Going to Try an iTunes Model? Nope (For Now). Netflix — the new Netflix, not the “old fogey” Qwikster DVD service — only sells one thing: You pay them eight bucks a month, and they give you all the movies and TV shows you can stream. Assuming they have them in their catalog. That simplicity is supposed to be a core part of the service’s appeal. 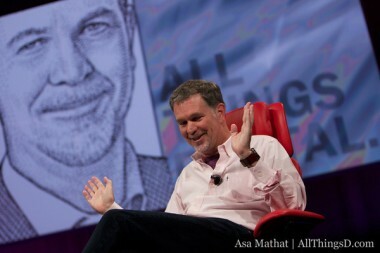 And CEO Reed Hastings has said, over and over, that he doesn’t want to monkey with it. Which is why it was weird to read that Netflix CFO David Wells told an investor conference yesterday that actually, he can see Netflix monkeying with it. Perhaps, he seemed to suggest, it could sell one-off rentals — video-on-demand, like Apple and Amazon and the cable companies all offer — for titles that it couldn’t include in its regular streaming package because of licensing issues. You know, traditionally what we said about VOD was it’s a low-margin business, we weren’t that interested in it because it sort of complicated the simplicity of the offering. I think in today’s sort of evolving and changing world, we’d look at a number of different options. In terms of making it convenient for folks to find that content rather than going to a competitor, to another site, we certainly would look at it. I wouldn’t expect us, for that to be, sort of, our reaction right now, but certainly in the evolving competitive set and the evolving market, we would look at other things as well. As Frommer notes — he has tempered his original post to emphasize this — this doesn’t mean Wells is saying Netflix will offer VOD any time soon. But it sure sounds like one of its most powerful executives is at least opening the door to the concept. But even that may be too much. After reading Frommer’s post, I reached out to Netflix PR to see if they could provide some context for Wells’s remarks. So there you go: Not happening! And if I can read into that just a bit — things that also aren’t happening could include a new tier of service for certain kinds of content, which was supposedly a key condition that Starz had demanded in its renewal negotiations with Netflix. Still. If earlier this year you’d have asked Netflix to tell you about its plans to raise prices by 60 percent and turn its popular DVD offering into a standalone service with a not-great name, I don’t think the company would have told you about its plans then, either.